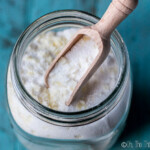 How to Make Homemade Laundry Detergent - Powder and Liquid - Oh, The Things We'll Make! 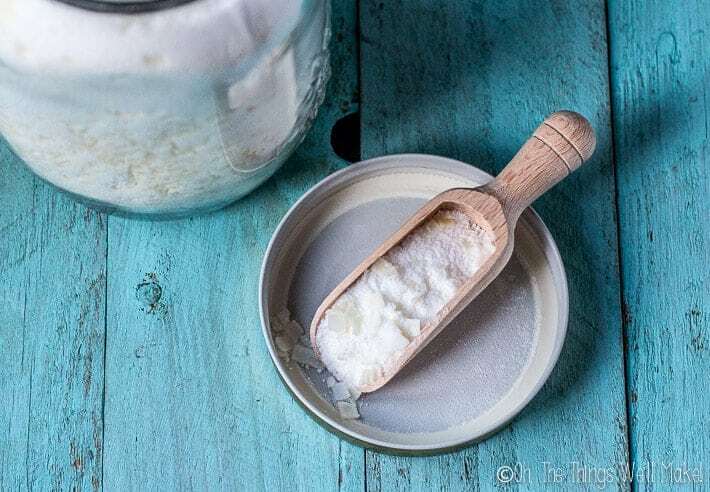 Making your own effective homemade laundry detergent is easy and can save you money. We'll show you how to make both a powder and liquid laundry detergent. Before continuing, I'd like to update this post with a bit of an introductory warning. While soap based “detergents” appear to work well for a lot of people, they can be problematic for many, especially those who have hard water. Minerals in the hard water react with the soap to form soap scum, which can build up on your clothes. Also, the various other additives in this soap can be harsh on the fabric when used over time. Because I have a water softener at home, I successfully used the following recipe(s) for many months. (I started with the full recipe and then started ditching both the borax and the baking soda.) I never had any problems with it. Those with hard water, though, may find that their laundry appears dingy over time when using a soap based cleanser. That's why I have formulated a surfactant based liquid laundry detergent for you to use instead. Working with surfactants may sound a bit intimidating at first, but it's actually very, very easy! I'd like to welcome back Patricia Cornwell to my blog with another post about DIY cleaning options. If you'll recall, Patricia is a small cleaning business owner, writer and self-proclaimed home improvement DIY expert. She works with a company called Tenancy Cleaning Ealing. In the past, she has shared information here about the best essential oils for disinfecting, and she also showed us how to make a DIY kitchen cleaning spray. Today, she's going to share some more DIY cleaning recipes with us, specifically how to make a homemade laundry detergent. I had been meaning to make my own laundry detergent for quite some time now, so I was really excited to see the topic of her next post. At first, it was tricky for me to find washing soda and borax here in Spain, but in the US it should be simple to find the ingredients. Some people are concerned about using borax in their detergents. If that worries you, feel free to leave it out. I tried washing a few bundles of laundry without it, and can't really say if there was much of a difference either way. To be honest, I think the most important two ingredients are the soap and the washing soda which has the most power against dirt and grime. I made both the powder and liquid versions, and have to say that they both have their pros and cons. The powdered detergent takes up a lot less space. The liquid detergent is basically just like the powdered version but dissolved in water. It's a bit gloopy, which is normal, so you can't really use it with a pump as I had intended. I do think it's easier to dose the liquid homemade detergent because it has more volume so you don't go overboard. With the powdered detergent, you really don't need much. I use around 2 Tbsp. of the powder when I do a load of laundry. If you really want to go super DIY on us, I'd suggest making your own basic beginner soap. It's not as hard as you may think! I've actually since written a recipe for a super easy laundry soap made with only coconut oil. Soaps with coconut oil have lots of cleaning power. Are you sick and tired of spending tons of money on laundry detergent every couple of months? And of course, you have to get the more expensive one, because supposedly it is better. But have you ever thought about an alternative? How about you make your own homemade laundry detergent? By making your own, you can choose the ingredients and can make sure that there are no dangerous chemicals that can be a potential hazard for your family. 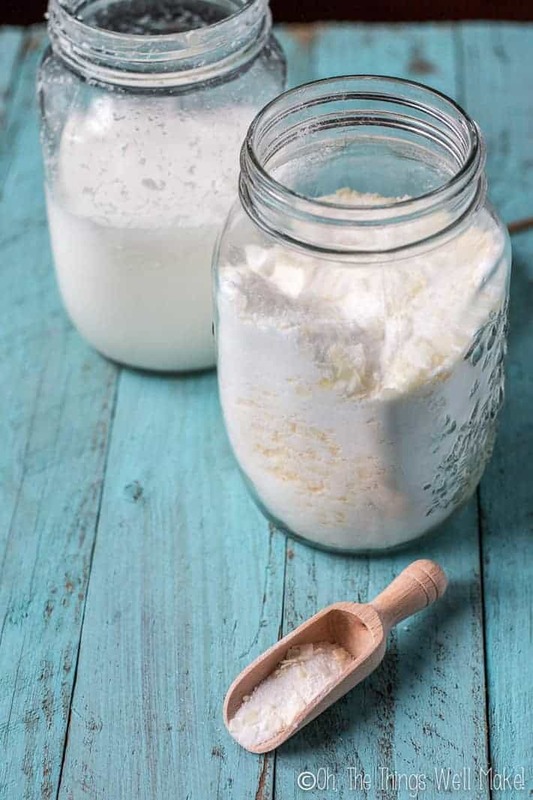 Making your own homemade laundry detergent will not only give you peace of mind, but it will also cut your laundry expenses in half. It is much more cost-effective to make laundry detergent at home. Making a homemade laundry detergent isn't difficult at all. All you need to do is buy several ingredients and mix them together. Yes, it does take a bit more time and work, but it is well worth it. You will need the following ingredients: washing soda, borax, castile soap, baking soda, and essential oil(s). The Essential oils are optional but they give your homemade laundry detergent a nice fragrance. In the US, these ingredients are easily found in stores, and they are safe and inexpensive. Figure out the ratios depending on how much you want to make at one time. You can adjust the size of the batch as you wish. Mix together all ingredients and store in a jar or box. It's best to use gloves while working with the washing soda as it can irritate your skin. Grate the soap into powder and put it in a pot with water. Heat and stir constantly until the soap is dissolved into the water. Add the soap solution, the washing soda, the baking soda, the borax, and any essential oils you want to use, to the bucket and stir. Add more hot water, as you continue to stir the ingredients, until they are all dissolved. Cover the bucket and let the detergent cool and gel overnight. Store the detergent in a container with a lid. It is normal for this detergent to be a bit thicker than store-bought laundry detergents, so don't worry if yours looks a bit gloppy. Just stir it up again before using it. If you're interested, you can find more information about making your own soap-based laundry detergents here. You can also make yourself a fabric softener, and it is even easier and cheaper. All you need is some white vinegar and, optionally a few drops of essential oil(s). The white vinegar will do the work, while the essential oil(s) will leave your clothes smelling fresh and clean. Just add around 40 drops of an essential oil per gallon of white vinegar and add the vinegar to either the softener compartment of your washing machine or manually add it to your final rinse. 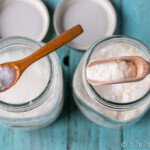 I hope you enjoyed this post and will try making this eco-friendly laundry detergent. Recipes like this one have been all over the Internet…and they’re all bad! These are alkali-heavy formulas that were known a century ago to be inferior. When people wore heavy-fabric clothes, didn’t have many of them, and didn’t wash them often, because they didn’t have machines, then it made sense for them to give the clothes a harsh cleaning in alkali (mostly washing soda), often in near-boiling water. But as fabrics got less heavy, and people had more clothes and washed them more often, and especially when they got their own washing machines, extensive tests were done using reflectometry and stretching showing that this washing dulled fabrics and wore them out faster, so alkali-heavy laundry detergents were considered so cheap and inferior, “borax” came to be a slang term for cheap goods in general. The good detergents were those made mostly of soap, with only a pinch of alkali — and a moderately-alkaline sodium silicate (as used in Rinso and Persil) was better than washing soda or borax. (This was before phosphates and non-soap detergent surfactants.) Not only that, but borax + washing soda is rather redundant, no particular reason to use both, and baking soda is just filler. 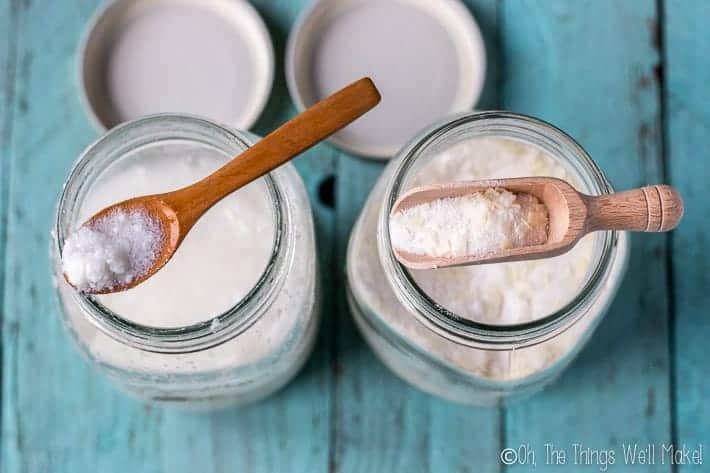 If you want to make your own soap-based laundry detergent, and you don’t have access to a better “builder” than borax or washing soda, then if you’re going by cups, use NO MORE THAN 1 cup of borax OR washing soda for every 4 cups of grated soap (preferably all-coconut or high-cocnut). That’s assuming you don’t want to wear out your clothes prematurely, and that you’re not using a HE front loader, because you have to use enough to make a good layer of suds when the detergent is based on soap. So then you won’t be wasting money on new clothes, but you won’t be saving a lot on detergent, because soap is the most expensive ingredient and you’ll be using plenty of it. The makers of laundry detergent are not, in general, ripping you off. It’s a very competitive business that organized crime tried to strong-arm its way into 50 years ago, but were forced out. They do sell a few fancy products that are not worth the extra money for most users, they do try in some cases to get you to use more than you need, but there are bargains out there that are better than buying bar soap (usually from the same company that makes the laundry detergent) to convert to machine use this way. If you make your own soap (usually as a hobby or small business making fancier stuff), then you can save a little money by also making some for your laundry, but otherwise you’re in the same league as the kids on YouTube making bubble bath by mixing commercial shampoo, water, and salt — of which the water and salt are superfluous. Well, this post was guest post by someone with a cleaning business. It isn’t really my area of expertise. For me, it’s important to make my own detergent, not because I think the detergent companies are ripping anybody off, but because both my husband and son have very sensitive skin. My son has atopic dermatitis and reacts severely to many types of fabrics and the chemical fragrances of detergents and shower gels. I make all of the soaps for cleaning clothes and people in our household. My husband suffered from severe burns on over 30% of his body after an accident on his fishing boat, and they took skin grafts from the non-burned areas to fix the burned ones. After the accident, he was forced to wear a special (polyester) suit that was made to fit him to help reduce scaring and help him regain movement. In the end, he became very highly sensitive to polyester and, like my son, to chemical fragrances, etc., etc. For me, since I love to make soap, soap is actually the least expensive part of the “detergent” for me. I do have a front loading machine, and to be honest, I don’t notice much of a difference in how clean the clothes get no matter what I use. I have even successfully used soap nuts for awhile as an experiment. How much water do you use in the pot with the grated soap? How much hot water do you add when everything goes into the 5 gallon bucket? How much liquid laundry soap do you use per load of laundry? With this having been a guest post, I’ll try to answer the questions as best I can in case Patricia isn’t available to answer them. When I tried her method to making the liquid detergent, I assumed that you were meant to mostly fill the bucket with warm water by the time you were done. The important thing, though, was really just to add enough water to dissolve the other ingredients well. The proportion of water to the other ingredients doesn’t really need to be exact because the only thing that will be affected is how thick or thin your final detergent is which is really a matter of preference. I tried it out in a smaller quantity and just added warm water until I was able to dissolve everything well. I did try both the liquid and powder soap recipes, but I have stuck with the powder version. At first it sounded easier to me to use a liquid detergent for some reason; I guess because it was what I was used to using. In the end, though, I find the powder so much easier to use (and a lot less messy!). As with other detergents, the amount you use will depend on a lot of factors: how dirty the clothes are, how hard your water is, what type of washer you use, etc. I began with just a spoonful of the powder detergent for most loads, and it is effective for me. (The scoop shown in the picture is what I use, and I use pretty much the amount shown, adding a bit more to more soiled clothes. Don’t think that the scoop is big, though! It’s actually quite small. I’m guessing the jar in the picture is the equivalent of a pint sized jar if that helps you judge the size better.) I have soft water and an efficient front loading washer, though. I try to use as little as possible not only to save money, but I figure it’s also better for the environment. You can experiment to find the minimum effective amount for your particular situation. I have been making my own laundry soap for a couple of years and have found that in the summer, I have to add something like Dawn dish soap or sal suds – 2 T. per gallon of liquid soap. This does the trick for the greasy, smelly clothes, although I hate that they contain SLS. I also use grandmother’s lye soap which my husband graciously grinds into large flakes. Those I keep in a plastic bag so they remain soft and melt more easily. It takes 5 minutes to put together. Recipe is 8 c. Boiling water, 1 c. each soap flakes, borax, soda ash, and 1/4 c. citric acid crystals. Melt the soap flakes, add everything but the citric acid and stir until melted. Add citric acid slowly (bubbles) and then the dawn or sal suds and last, whatever eo’s you like. When the shell starts to form on top, I take a stick blender to make into a creamy soap, place that into a gallon jug and add water to make a gallon. Voila! It is so soft that it makes your skin feel slick when you rinse them. I just wish there was an alternative for SLS! Thanks for your recipe and tricks! I’m curious as to why you need the dish soap in the summer? Is it because of heat/sweat in the summer causing an odor in the clothes? I’ve been using the powder detergent since I posted this, and I haven’t had any issues with it. It’s been working really well for me. I just add in a few drops of citrus essential oils (orange, lemon, or grapefruit- whatever I have around) to the powder when I add it to my washing machine, and have to admit that I was really surprised by how the clothes actually do pick up the scent of the EOs. I thought that the fragrance would disappear with the rinsing, but I find the clothes to hold the essential oil scent added to the detergent even better than the ones I add to my homemade wool balls in the dryer. If you do find that you need the addition of a dishwasher detergent, perhaps you could try a more natural one without the SLS? Or maybe using a coconut oil soap for the grated soap part would help better with the grease? I’ve been wanting to share a recipe for making coconut oil soap because they are really good for cleaning and cutting the grease. I would like to know how much of the detergent are we to use in an High Efficiency (HE) washer? We normally use much less detergent and we buy special HE detergent that dissolves faster and doesn’t suds up as much. According to Technofresh.net you should only use 1 tablespoon of laundry detergent and 1 tablespoon of fabric softener per load. So how much do your recommend using per load? I’m not really sure. I’d have to do a little more research into what high efficiency washers are. Here in Spain most of the washing machines are front loading and are all pretty much the same system. I’ve been using about a Tablespoon of this detergent in my washing machine- maybe even a little less- and it has been working pretty well for me. I’d probably recommend trying around a tablespoon of this one too, and then adjusting up or down as needed. That’s a good question, Savannah. I haven’t been using it for very long yet, and have been pre-treating stains because I need to with conventional detergent too. My son’s school uniform is a pain to clean!!! I (luckily) 😉 no longer have any soiled cloth diapers around to give it a try. Maybe I can get Patricia to weigh in on it. I guess if it were me, I’d give it a try and line dry so as not to set any stains, just in case. In any case, I’d love to hear how it goes if you do give it a try. For diapers, start with the above recipe, leave out the borax, washing soda, baking soda, and essential oil, just use the soap and plenty of it. My diapers were done in soap powder (Ivory Snow); it had a little bit of fluorescent brightener and some perfume, plus probably a tiny bit of sodium silicate as a corrosion inhibitor for the washing machine — but do you really care if your baby’s diapers are bright? The soap you’re using is probably already perfumed, and washing machine parts today don’t need the protection provided by silicates. But you have to use enough soap to make lots of suds on the wash water.